The means by which a rider communicates with a horse.These can be natural or artificial. A piece of tack attached to the reins that fits in the horse's mouth. The highest part of the saddle at the back. Changing the direction in which you ride around the ring (arena). 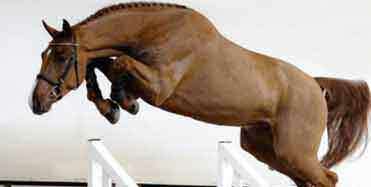 The link, through the reins, between a horse's mouth and a rider's hands. The area under a horse's tail. Exercises performed on flat ground to show the obedience, agility and suppleness of a horse. The joint that sticks out just above the hoof. A newborn horse or pony (up to 12 months). The movements made naturally by a horse - the walk, trot, canter, and gallop. The wide strap that holds the saddle on. A ride out on a horse or pony. Sore feet, usually caused by overeating. Describes a horse being stubborn and refusing to go in the right direction. The front raised part of the saddle. When a pony stops in front of a jump instead of jumping over it. 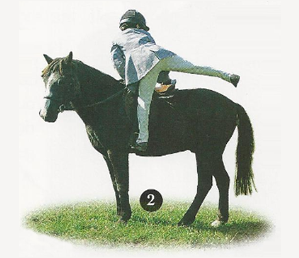 The position in which you sit in the saddle. You should be able to draw a vertical line through your ear, shoulder, hip, and heel when your position is correct. The straps that hold the stirrup irons onto the saddle. The two metal loops attached to the stirrup leathers that a rider's feet go in. 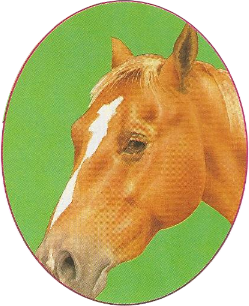 When all four of the horse's feet are off the ground. The change from one gait to another. Before you go riding, you have to get on your horse, and when you have finished, you have to get off. This sounds very obvious, but there are ways of doing both that are safe for you and comfortable for your horse. Soon you will be able to do both without even thinking about it. 1. 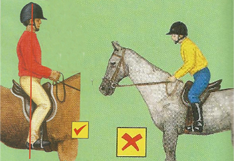 Stand at your horse's near (left) side, by its shoulder, and face the rear. Pick up the reins in your left hand and hold the pommel. Put your left foot into the stirrup iron. 2. 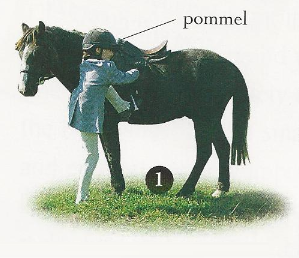 Hold the cantle (back) of the saddle and spring upward. Swing your leg over the back of the saddle. 3. Lower yourself gently into the saddle, and find the right stirrup with your right foot. 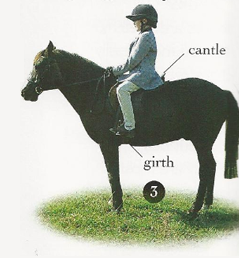 Take the reins in both hands and check that your girth is tight. Make a fist and place your knuckles against the stirrup bar. If the leathers are the right length, the bottom of the iron should reach your armpit. Correct Seat Sit in the center of the saddle with the balls of your feet resting in the stirrup irons. Straighten your back and keep your head up and heels down. 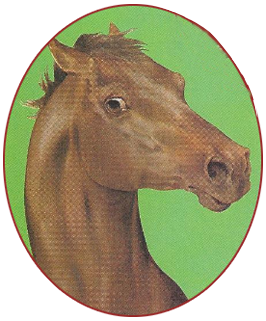 When your horse is interested in something, it arches its neck, pricks up its ears, and snorts. 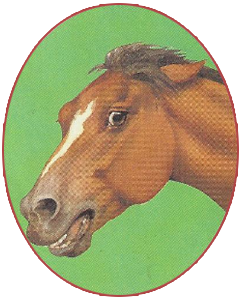 If your horse is warning you not to come too close, it may turn its rump toward you. 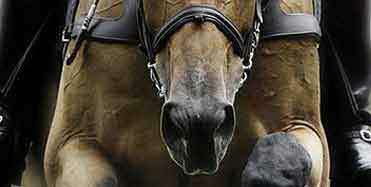 Watching horses closely will help you to understand their language. This pony is alert. Both ears are pointed forward in the same direction. The ears are relaxed and are neither forward nor back. The eyelids may droop and the mouth is relaxed. The ears are laid flat back, the nostrils are flared, and the mouth is open, ready to bite. The ears are back, the eyes are rolled back to show a lot of white, and the nostrils flared. Q. Do horses lie down to sleep? A. Horses and ponies usually sleep standing up. That way, horses in the wild can escape quickly in case of danger. Many horses do lie down to sleep from time to time. Q. Is it normal for my horse to rest its leg? A. Resting a hind leg is a common sign of drowsiness. If your horse rests a front foot, this may mean that it has an ailment called laminitis and you should seek advice. 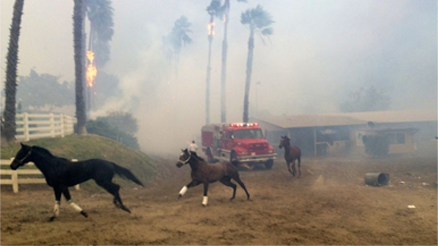 Hundreds of elite racing horses stabled at San Luis Rey Downs in San Diego County were set free Thursday in hopes that they would escape the flames as one of the major California wildfires consumed the training facility. Trainers estimate at least a dozen of the thoroughbreds worth hundreds of thousands of dollars have died. 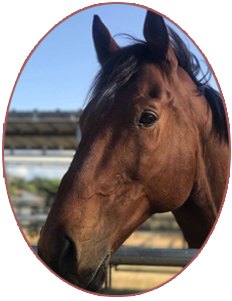 The training facility is known for stabling high-caliber horses that compete at Del Mar, Santa Anita and other top-flight California tracks. A sign outside the complex reads "Home of Azeri," a reference to the former racing mare who was named the 2002 Horse of the Year and earned over $4 million in her career. Mac McBride, who was working with the center's trainers, said it was "total pandemonium when several hundred horses were cut loose," but he believes most of the horses survived. Some of the 450 horses stabled at the training facility located near Bonsall, just a few miles from where the fire broke out, were moved to a nearby track. "There was so much smoke it was difficult to see," said horse trainer Dan Durham, who got his 20 horses rounded up and was loading them into vans to be evacuated. "Some of the horses were turned loose so they could be safe. They were scattered around." 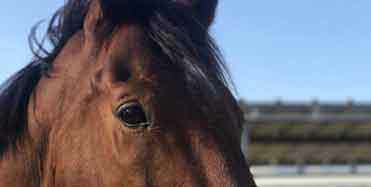 Several trainers said some of their horses were killed at the facility. "It was dark, everything was hot and she wouldn't come out. I opened the pen and tried to get behind her and get her out, and she wouldn't get out," horse trainer Cliff Sise told San Diego's KFMB-TV. "She burned to death that quick.